Citrix Systems has thrown a dizzying array of cloudy things at its partners and customers at the Synergy customer conference it is hosting in Barcelona, Spain this week, and like the cloud itself, the whole thing was a bit amorphous. The main takeaway is that Citrix is going to buy or build the tools necessary to make itself a hub in what it calls the personal cloud, the new computing paradigm for the post-PC era. The main news coming out of the event was that Citrix has snapped up App-DNA, a British software company that has created a set of tools called AppTitude. They catalog applications running in your data center and tell you which can be moved to a particular release of an operating system or hypervisor. AppTitude can also do some remediation on applications ahead of a migration, and also hook into Microsoft's Windows Installer or Citrix' XenApp and Microsoft's App-V virtualization tools - packaging them up and delivering them as services from the datacenter to end users working from clients over the LAN or WAN. Presumably in the wake of the App-DNA acquisition, Citrix will hook AppTitude into its XenDesktop backend for virtual desktops and into the Receiver universal client it has running into XenApp and XenDesktop. This lets it perform similar functions for virtual PC images and devices that access those PC images from other devices.The terms of the App-DNA acquisition were not disclosed. Citrix also said it was worked with NComputing, a maker of thin clients, and Texas Instruments, one of the big proponents of the ARM RISC processor, to etch the HDX high-definition media protocols at the heart of the Citrix stack. The resulting ARM processor, in theory, could be embedded into TVs, kiosks, and other displays to provide a zero client virtual PC footprint into those devices. The HDX chip, which is called the Numo 3, is based on a dual-core Cortex A9 design that supports VGA or HDMI graphics at 1920x1080 resolution. It also has support for up to 1GB of DDR2 or DDR3 memory, up to 2GB of flash, 32Kb of onchip ROM, and an interface to USB ports and PCI-Express and SATA ports. It looks like NComputing did the chip design, Citrix supplied the HDX features, and Texas Instruments is fabbing it. The first devices using the HDX chip will be in the market in early 2012. "We're convinced that as a result of this we will see the world's first sub-$100 zero clients," said Wes Wasson, chief marketing officer, in a briefing with journalists ahead of the announcements in Barcelona. In effect, adding an ARM-based HDX processor turns any device with a screen into a virtual PC, and that includes all that gear out there on the factory floor, call center, and in other devices like medical equipment. Wasson said that HDX gets the experience for users working with a virtual PC close enough to the local experience of the PC. 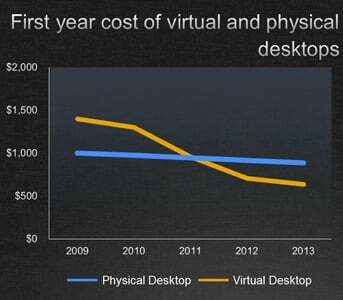 Other technologies, such as its FlexCast, IntelliCache, and Personal vDisk help improve the experience further, and lower the cost of implementing virtual desktop infrastructure. FlexCast is an approach to VDI using XenDesktop to deploy virtual apps or virtual PCs; IntelliCache is a means of storing PC images on local images in a server instead of on expensive SANs back in the data center. This is similar to what Kaviza was doing with the kMGR management software at the heart of the VDI-in-a-Box stack before Citrix bought it earlier this year; and Personal vDisk, which Citrix got through its acquisition of RingCube back in August, and separates user data in a virtual desktop from the operating system and app image data. Citrix had a slew of other announcements. It has slapped its brand on the VDI-in-a-Box solution for small and medium businesses, which deploys a VDI stack that is a lot less expensive and complex than XenDesktop on a cluster of x86 servers, and fields up VDI images from that cluster. The cluster's kMGR does the job of brokering requests for PC images down to the clients on the network, and does not require a SAN. With VDI-in-a-Box 5.0, the hypervisor on the back-end cluster can be XenServer from Citrix and Hyper-V from Microsoft; prior releases could only support ESXi from VMware. Citrix has also put together a bundle of its GoToManage remote systems management cloud services with the VDI-in-a-Box VDI service to allow channel partners to remotely manage clusters running the Kaviza code and serve up desktops to their customers. Citrix plans to roll out this updated VDI-in-a-Box-GoToManage bundle before the end of the year. Incidentally, as part of the Barcelona blitzkrieg, Citrix is rolling out its GoToManage service in French and German, and its GoToMeeting service in Spanish and Italian. The HDFaces video extensions to GoToMeeting were added in the wake of the acquisition of German software house NetViewer AG. In the first half of 2012 a new feature of GoToMeeting will be Workspaces, an integrated file sharing and meeting area inside of the service. The new ShareFile service, which Citrix acquired two weeks ago, is being integrated with the Receiver universal client that will allow you to map the file sharing services to your virtual desktop image, and have that storage follow you no matter what device you use to access that virtual desktop. This data tab in Receiver, backed by the ShareFile service, will be ready by the end of the year. The NetScaler Cloud Gateway, which Citrix previewed back in May and had hoped to ship in the third quarter, will now ship before the end of the year. The details on the Cloud Gateway were a little thin last summer, but Citrix said it would be used as a connection broker for internal apps, SaaS apps, and apps running on public clouds, and would do user provisioning, license management, and single signon for users. The Receiver client hooks into the Cloud Gateway, can run on PCs and Macs, tablets, smartphones, and thin clients, and has been certified on over one billion devices worldwide. Now, with the ShareFile service, Cloud Gateway will be able to broker connections to data as well. This week, we learn that Cloud Gateway has an iTunes-like retail front end called StoreFront, which sits in front of XenApp, XenDesktop, Web, SaaS applications and data services like ShareFile, and mobile apps, and presents them in an online catalog. Wasson said that Citrix would offer a CloudGateway Express Edition, which could be used to serve up Windows desktops and applications, and that this version would be free of charge to XenApp and XenDesktop customers. The Enterprise Edition of Cloud Gateway will add the ability to broker Web and SaaS apps, and further down the road it will broker data services and mobile apps. The Enterprise Edition will not be free; pricing was not announced. Attendees at the Synergy conference in Barcelona also got to see a preview of the CloudStack 3 cloud fabric, an update of the tools it got through its acquisition of Cloud.com back in July. Citrix said in August that it was taking the CloudStack 2.2.10 code completely open source. CloudStack 3 will also be open source and will incorporate features from the rival OpenStack cloud fabric, including the "Swift" storage cloud engine from the current "Diablo" release of the OpenStack code. Wasson said that as other OpenStack features mature, they will be borged into CloudStack. CloudStack 3 will support Xen, Hyper-V, KVM, and ESXi hypervisors, but Wasson said it will also sport a "meaningful integration" with a cloud-optimized variant of the XenServer 6.0 hypervisor from Citrix. CloudStack 3 will also integrated with NetScaler acceleration appliances, and will presumably favor the virtual appliance versions that can run on VM's in a CloudStack cloud. CloudStack 3 will also include a Cloud Portal, which is aimed at helping service providers run a cloud business. It will have two components. Cloud Portal Business Manager does the provisioning, management, metering, billing, and tech support for VM images that a service provider sells; it is available now. Camwood, owners of AppDNA confirmed in June 2012 the sale price was $92m.